Most often the officer investigating a Kansas DUI will request a breath test of the driver. Blood tests are usually reserved for instances where the officer believes the driver is under the influence of drugs other than alcohol which would not be detected by the breath testing machine, or when there has been serious injury or death. 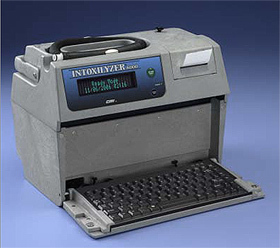 In Kansas, police departments use a machine called the Intoxilyzer 8000 to test breath for alcohol. 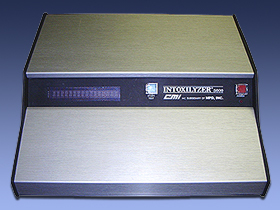 The Intoxilyzer 8000 is manufactured by a corporation named CMI, Inc., in Owensboro, Kentucky. The manufacturer claims that the machine can filter out various compounds that often get mistaken for alcohol. They also claim that the machine can detect “mouth alcohol”, that is, alcohol that is trapped in the mouth but is not in the blood stream. These claims can and should be challenged judicially because scientific research has shown them to be largely without merit. People who paint houses or work around solvents may produce a positive reading over the legal limit without ever having had a drink (due to breathing acetone and/or toluene). Mouth alcohol is a big problem for the machines and, thus, a 20 minute waiting period is required before a breath test is administered to attempt to insure that there is no mouth alcohol. The Intoxilyzer 8000 is also subject to radio and electrical interference. Variations in the voltage in the electrical lines or the use of mobile phones, radios, and police scanners around the machine may produce a false positive reading. Each machine is inspected only once per year for accuracy by the Kansas Department of Health and Environment. The individual police agencies are supposed to do routine calibration checks and maintain records of them. These are often important documents to obtain in every DUI case. Police officers are required to be certified operators of the machine. Before a breath test can be admitted into evidence at a DUI trial, the prosecutor must show that the breath test operator (police officer) operated the machine according to the manufacturer’s recommendations and the rules and regulations established by the Kansas Department of Health and Environment.The “manufacturer’s recommendations” means the owner’s manual for the Intoxilyzer 8000. Most officers have never seen the owner’s manual for the machine and have no idea what the manufacturer’s recommendations are. The “rules and regulations established by the Department of Health and Environment” means the protocol for running the Intoxilyzer as promulgated by the state agency and the administrative regulations set out by the agency.You will hear the term “protocol” used a lot in your DUI case. The protocol for the Intoxilyzer 8000 is a set of seven steps that must be followed for a breath test to be valid. First, and most important, is the 20 minute “observation period”. During this time the officer must not leave the subject’s presence and must insure that the subject does not put anything in her mouth, belch or regurgitate. The other six steps deal with steps the officer must take to prepare and utilize the Intoxilyzer 8000. If he misses any one of these steps, he has failed to follow the protocol and the test should be thrown out. The breath test machine will do internal calibrations and checks. The subject then must blow into the machine for an extended period of time. The machine is designed to test only “alveolar air”, which comes from deep in the lungs, and only after all the other air in the lungs has been blown out. If a subject doesn’t blow hard enough, the machine will read “insufficient sample” or “deficient sample”. Sometimes an officer will interpret an inability or unwillingness to blow hard enough as a refusal. The subject must be standing straight up to give a deep lung sample. Tests given while a subject is sitting down or bending over are improper. The breath test printout and all of the maintenance, testing and calibration records must be studied very carefully to determine whether the machine was functioning properly. Despite the fact that the Intoxilyzer 8000 has been the subject of many challenges in the courtroom, judges and jurors tend to trust it. Thus, it takes hard work on the part of the attorney to expose the fallacy of the machine. As mentioned earlier, if one of these machines says your breath alcohol was .08 or higher within 3 hours of driving, you may be convicted of DUI. When possible, knocking out the breath test is a very important element of your defense in a Kansas DUI. 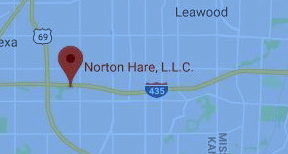 You need an attorney with a lot of experience and knowledge about the machines and infrared spectography to successfully defend one of these cases.